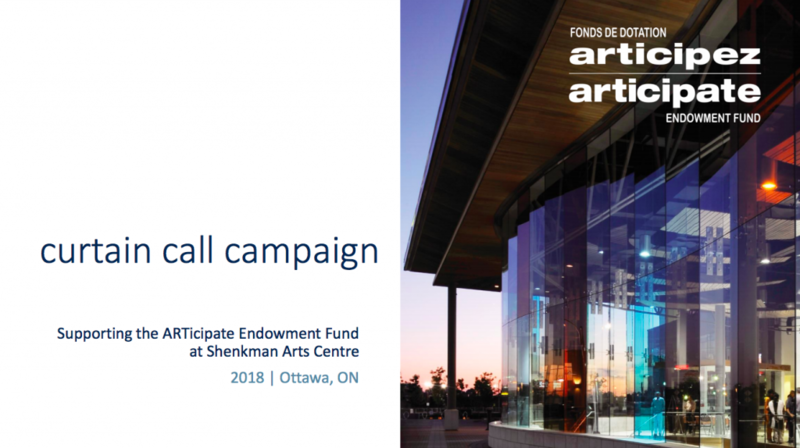 Since 2010, the ARTicipate Endowment Fund has provided over $582,867.80through 153 grants awarded to local artists and arts groups including the Shenkman Arts Centre’s five Resident Arts Partners (Arts Network Ottawa, Ottawa School of Art – Orléans Campus, Gloucester Pottery School, Mouvement d’implication francophone d’Orléans (MIFO), and Ottawa School of Theatre). To read about this year’s ARTicipate grant recipients, click here. On April 28th Arts Network Ottawa celebrated the 10th Anniversary of the ARTicipate Endowment Fund and launched the Curtain Call Campaign – our concerted effort to hit the $5M endowment fundraising goal before 2019. We are very close – so close that we have been challenged by the Shenkman Family Foundation to raise the remaining $200,000. With sincere thanks to the Shenkman Family Foundation for their generosity, 100% of donations to the ARTicipate Endowment Fund will be matched dollar-for-dollar. Your donation, large or small, will be doubled and have twice the impact for Ottawa arts and culture. All donations will be endowed in-perpetuity as a legacy for future generations and will be distributed in the form of grants to artists and arts groups associated with Shenkman Arts Centre. There are many ways to support the Fund – here are just a few! You can make a one-time donation. No amount is too small – every donation counts and will be matched! You can make a monthly or recurring donation. Easy & affordable, donations can be charged to your credit card or made through post-dated cheques. Or for those who wish to make a greater impact, consider one of the Centre’s in-perpetuity naming opportunities that start at $15K. For more ways to give, please visit the ARTicipate website. Be a part of ensuing the future of the Ottawa arts community is bright and vibrant by contributing to the Curtain Call Campaign today! If you have any questions and would like more information, feel free to contact Margo Hébert, Philanthropy and Community Relations Manager at Arts Network Ottawa at margo@artsnetottawa.ca or 613.580.2767 for assistance.